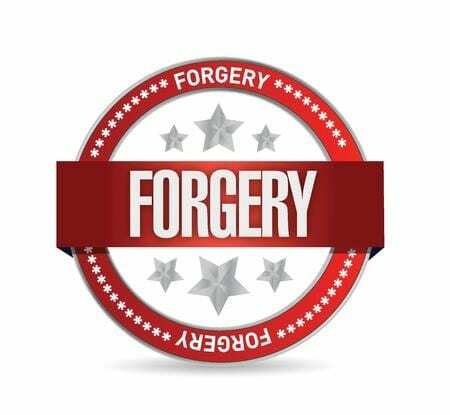 Forgery is a punishable offence under felony in majority of the 50 states and also by ­federal government. It normally involves the possession, altering, making and use of illegitimate writing for fraud. It takes place in different forms ranging from falsification of academic transcript to signing a different name on bank check. Forgery done in terms of currency is also referred as counterfeiting. The society is heavily reliant on production and exchange of documents which are trustworthy and legitimate. There are many far reaching and negative outcomes of forged documents on political entities, individuals and businesses. It attracts often the harshest of punishments in many cases. Earlier, the offence was limited to making or just altering a false writing. Other aspects such as possession, use and direct offering to defraud came under the category of a different offence. It was referred as “uttering a forged instrument”. For instance, in case an individual uses flawed identity card for obtaining loan or credit, he or she would be considered as guilty of the same. The person may not be responsible for producing the forged document and most of the states treat such offences as forgery crime. Forgery starts off with a person making, altering, using or possessing an invalid writing. While thinking about forgery, some people confuse it with merely the production of false writing. Apart from forging letters and certificates, altering an already existing writing can be considered as forgery. However, the alteration needs to be materialistic and impact a legitimate right. For instance, forging an individual’s signature with a document comes under materialistic alteration. It would simply misrepresent identity of a different person who has signed it previously. It must entail serious and negative legal consequences. Delete, add or change of important document portions without consent also come under material alteration. The concerned writing should have a certain legal significance. It must be materially altered or fabricated to constitute something that it’s not supposed to be. Defendant should have intentions to defraud a person or entity like a government organisation to be guilty of punishment. The penalties in these forgery crimes range from jail term to fines, restitution and probation. There are some states with laws on specific forgery types that are punished leniently compared to felony offences. States have laws for punishing such crimes where judges decide the appropriate punishment. At Oregon, the crime penalties vary from community services to probation, five years jail term and almost $125,000 as fine amount. In Minnesota, the penalties in check forgery depend on the total amount of funds at stake. If the amount is $250 or below, it is punishable with jail term and almost $3000 as fine amount. With the amount going above $250, it can lead to 5 years jail and $10000 fine amount. For determination of suitable punishment, the states mainly consider the kind of document in question.